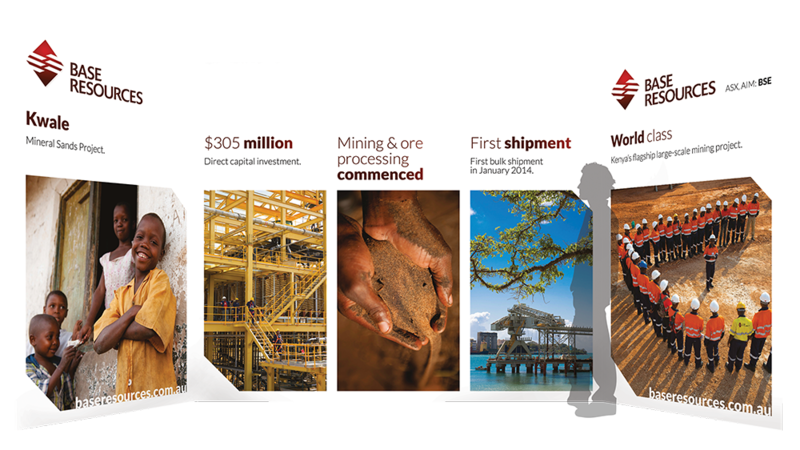 Platform Communications has worked with Base Resources to deliver effective investor relations by producing their 2013 Annual Report. Platform’s design team used their creative expertise to produce an engaging, informative and visually appealing annual report based on the Base Resources brand. The Platform team was also engaged to develop a concept and a theme for Base Titanium when they exhibited at the Nairobi Conference in 2013. The Platform team designed the booth panels for the exhibition which were used to capture attention and communicate the progress and success of the Kwale Mineral Sands Project.